These are some of my favorite gifts to make. They're fairly simple, inexpensive (less than a buck each) and lovely. Each one has a unique, organic form that I can stare at for hours. They would also make gorgeous table decorations for a wedding reception. 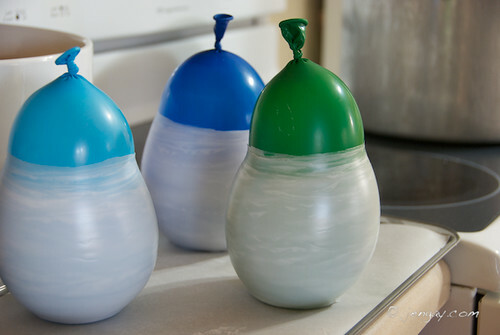 -Fill balloons with water (not water balloons, regular ones). As usual, though, I've included a much more detailed version. And pictures. Lots of pictures because Jenny helpfully offered to photograph this project. These really only require just a few Supplies to make. I also always pick up a pack of soy, tealight candles, the kind in plastic containers, not metal. I linked to some on Amazon so you can see them, but they've got 12 packs of them at Target for only 4 or 5 bucks. This kind won't ruin the luminarias because the soy melts at a lower temperature than regular wax and also because the kind with metal containers will conduct too much heat and melt right through the bottom. Obviously, a battery operated LED tea light would work too, but I prefer real candles. OK, so On To The Making, shall we? For our first attempt, we used a saw to get small enough pieces of wax. And by "we" I mean Jeff. Because I didn't have enough patience for that nonsense. But since Jeff is immune to nonsense (or at least has learned to pretend to be during our 13 years together), he volunteered. This took a really. long. time. Luckily, in later years, I found a much better solution. Using a screwdriver instead of a handsaw will save you about 45 minutes and a huge mess. I took a couple of wacks at it, working the screwdriver partially in and removing it, lining up the holes in a straight line. After a few, a nice sized chunk easily broke off. Next time I'll do it on a folded up towel on a slab of concrete or something, though. You run the risk of gouging whatever it's on. Which is something I didn't notice until the next day. Then I melted the wax in the double boiler. The picture below shows my set up, with wax in the inner container and water in the outer container. 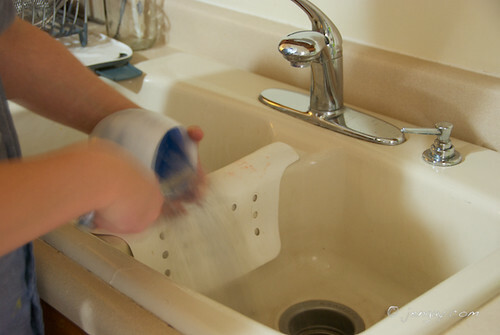 If you want, you can use a much smaller outer container for the water, like shown here. In fact, I'd check that link for more information about safely melting wax. If you are attempting this, DO NOT put the wax container directly on the stove; it can create a very interesting fireball if overheated. Also, it's a good idea to have a fire extinguisher on hand, just in case. A couple tips for this bit. 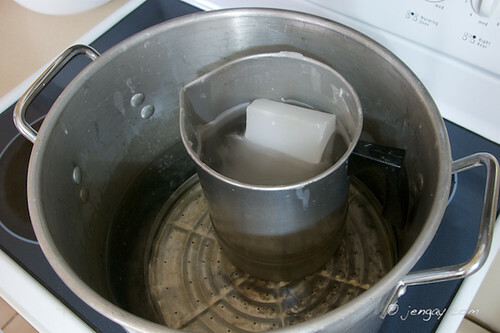 -The water only needs to be at a bare simmer. Boiling isn't necessary or helpful. -The water level only needs to be a couple of inches up the side of the inner container, not at the same level as the wax inside. 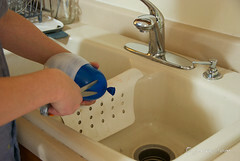 -Make sure to add more water as necessary to account for evaporation. DO NOT let this boil dry. -Only add enough wax so that the level is about 3 or 4 inches from the top. 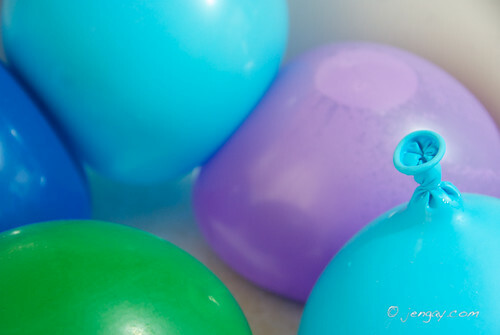 The water balloon will displace lots of wax, so you don't want it filled to the top. -Try to keep the wax at 180 degrees (F) while working. 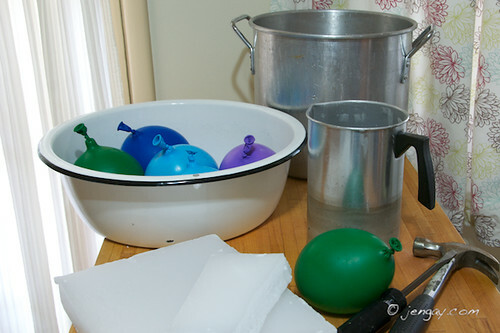 While the wax is melting, I fill up the balloons with water, letting as much of the air out as possible before tying them closed. Make sure that these are small enough to fit down inside the inner pot without touching the sides. Since some of these seemed somewhat misshapen and a bit too squatty, I adjusted their shape, rolling them back and forth like so. It can make a difference. If you care about that sort of thing. Note- I definitely should have unrolled my sleeves down to my wrists, for a bit of protection. Just sayin. 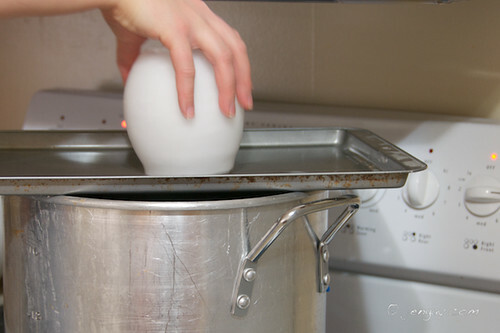 Once the wax is liquefied, I slowly dip one balloon 3 times and then place it on a parchment paper covered cookie sheet, pushing down gently to make the bottom flat. On the last dip of the three, I try to pause for a few seconds, shaking it a bit and letting as many of the drips as possible fall off before setting it down. Note- if you forgot to remove all the air from the balloon, just make sure that you don't dip it any further than the water/air line. In fact, don't get near it. 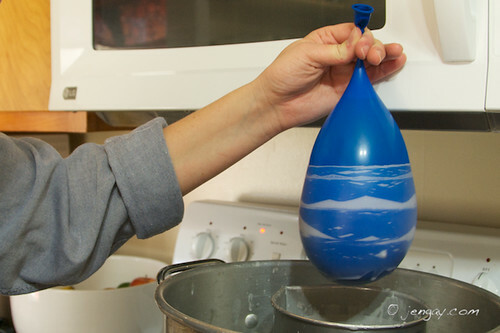 The water inside regulates the temperature and, you know, keeps the balloon from exploding. Also, be sure to keep the balloon from touching the side of the container. 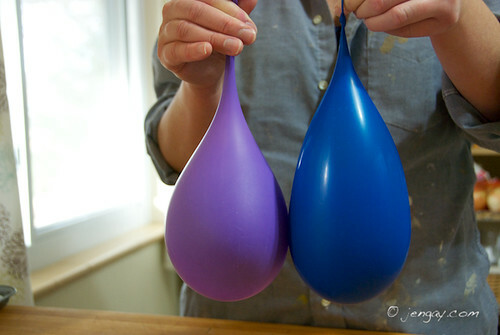 Then I dip two more balloons the same way. I only have three going at a time because it's easier to keep track of the number of dips. Then I repeat. Total, I do anywhere from 5 to 8 sets of 3 dips (15 to 24 layers total), depending on how thick I want them. This time they were on the thinner side, only 15 layers. After they are completely cooled, I empty them over the sink. The tops will be raggedy at this point. I've considered leaving them this way, but I'm worried they'll get mangled. Now I remove the parchment paper and place the cookie sheet on top of my double boiler. After about 5 minutes, it gets hot enough to melt the rim smooth. 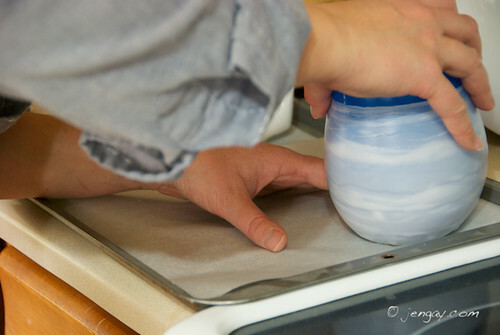 If you're using a smaller double boiler, you can put the empty cookie sheet in a low oven and heat it that way. Just rub the top of the luminaria around on it until it's smooth. Add a tealight and you're done. One final and important note- The idea originally came from Peak Candle Supply, where I bought my wax. I've made these on many occasions and have never had any problems. But if a balloon were to break during the dipping process, it would be very bad. So this project is very much one to do at your own risk. these are awesome - thanks for sharing! I was looking for cheap luminaries that were beautiful too and this is perfect Thanks! I'll have to put this on my list because it is an awfully lovely project with equally lovely results. Imagine how nicely it might work to use these as luminarias along a walkway? Totally cool! Thanks for the tutorial. I think I may tackle this in the near future! saw this featured on Craft. WOW. I definitely want to try this. Thanks for the great tutorial. There is a REALLY easy to break your wax into usable pieces. 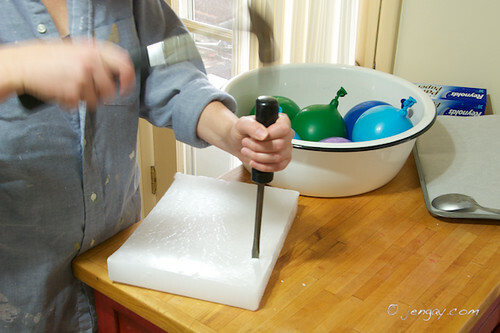 Simply stick the entire block into the freezer and let it get good and frozen. Take the block out to the sidewalk or garage floor and hit it several times with a hammer. Voila! Usable sized pieces effortlessly! This is brilliant! I love it! I am going to try this for my Halloween party next year! Thank you for sharing the idea!!! They're beautiful! I can't believe how incredibly creative and talented you are. :) I can't wait to give these a go for a future project. This creation is just beautiful as well as the pictures. I hope to try it out ! And from a rapid glance at your blog I feel at home. Will follow up. You could call them Balloominarias. I just found my way to your blog for the first time and it is gorgeous. Love your balloon candles. My mom used to make candles when I was a kid and I keep thinking of trying it but haven't seen anything worth buying the supplies for. Now I have and I think I will try this technique. Wouldn't it be fun to make Halloween candles with this technique...or Red white and blue for the 4th of July? Fun fun fun. I love these. 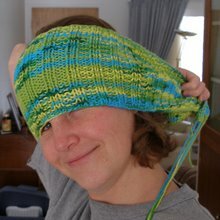 What a wonderful tutorial and great blog. I can't wait to read more. Off to go post a link to this great idea and blog. My quandry...share a link with all my friends to your tutorial? Or....should I just make them myself and look brilliant? Oh well, it's Christmas, I guess I'll share and look brilliant for finding you! Oh,interesting! 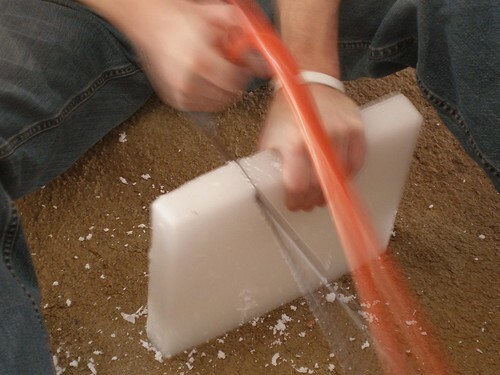 I make ice candles in the winter with balloons. My kids always try to bring them inside to enjoy because their so pretty but yeah...they don't exactly last long. This could be our inside version. You are simply incredible, I swear. Those are simple, yet completely gorgeous. Girl, have you ever thought of writing a book with this stuff?? Just sayin'. You could be like the groovy Buddhist Martha Stewart or something, you know? "You could call them Balloominarias." A request: a picture of some of these beauties, lit up! I mean, besides the photos that are already there. Okay. Re-phrase. I mean a photo where it is, like, more dark so that these babies really GLOW! You know, like they do with luminarias, outside, when it is dark. these are AWESOME! i wnt ot make them for my wedding! 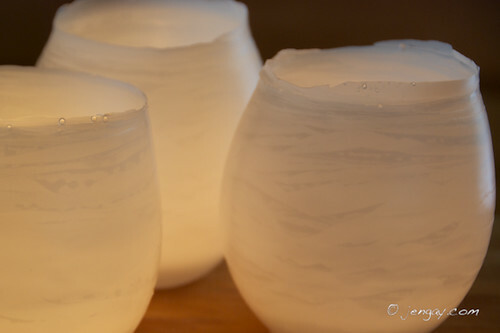 would votive candles inside melt them? Anon, I'm not sure if votive candles would melt them or not. I've only tried them with tealights. Has anyone tried adding dye to the wax? Would that cause any problems? I was thinking of making these for my wedding, my wedding colors are pink and green. Do you think I could swirl some dye into the wax to make pink and green ones? Roue, I have seen them dyed. I can't imagine that it would cause any problems at all. Great idea will have to try oneday! Thanks for sharing! 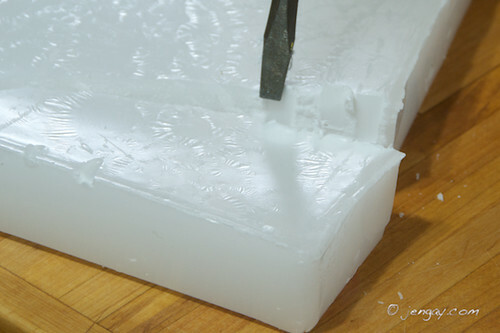 A very easy way to cut wax is I take a butter knife and heat it up on the stove for a couple seconds, then just cut. It pretty much melts right through. You will have to do it a couple times, but saves a lot of time, effort, and mess. This looks awesome! I'm considering doing this with LED tea lights for my upcoming wedding (no open flames allowed). I was wondering how many luminarias you got out of your 10# of wax. It's hard to give an estimate because it really depends how thick you make them. And also you always need more wax than you'll use because you need to keep the level high enough to dip. Having said that, I'm guessing I got at least 20 candles out of the ten pound block. And good luck with your wedding plans! Thank-you for this excellent tutorial. 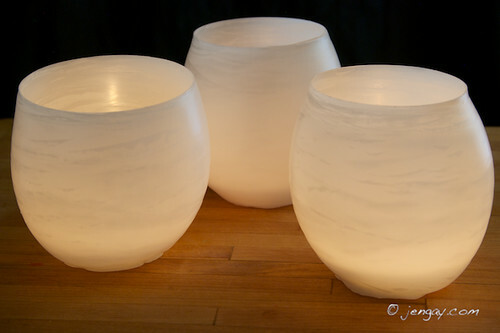 I made them with beeswax, which is incredibly beautiful. My kids and I also added dried pressed flowers to them using Mod Podge. Their teachers will love these Christmas gifts! This is a pretty fun idea, something to make for a rainy day I think! Muito legal!!!!Adorei!!! Não sou muito habilidosa com as artes manuais, mas essa vou tentar. Obrigada.